Ok, I love horror movies. Should be pretty obvious by now. 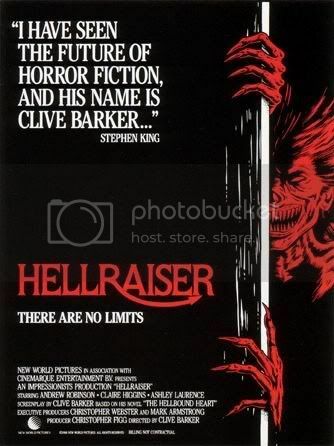 That is why you should be shocked that, until tonight, I had never seen Hellraiser before. I have seen so many of the greatest horror films ever made and just as many of the worst. But occasionally a classic movie comes around that I have heard of since I was a little kid and somehow just never got around to watching. Hellraiser is definitely one of those movies. Hellraiser is the story of Larry and Julia, a couple who go to live in a new house that they inherited. When they move in, they find traces of the Larry's brother Frank living there. They assume he has left, but he is still very much there, though he is trapped in a another dimension. One where pain and pleasure are synonymous. After cutting himself on a nail, Larry's blood releases Frank from this hellish world, in the form of a skinless creature. Frank needs more blood to become whole. He enlists the help of Julia, whom he once had an affair with, to bring victims to him so he can use their blood. Kirsty, Larry's daughter and Julia's stepdaughter, finds Frank and accidentally opens up a portal to the other dimension via a seemingly harmless puzzlebox. Enter Pinhead and his group of Cenobites, to find the escaped Frank. WTF? Yeah, I know. Pretty wacky stuff. What makes this film such a classic is a combination of its grisly makeup effects and a completely original story. Seriously, what other movie is like Hellraiser? Certainly nothing that came before it. My friend Yeti described this movie best when he called it a "very wet movie". The makeup effects are all over the top but very realistic and gory. It's a shame it took so long for me to see this.